After a short spell working in London Val Byrne returned to Dublin and established a partnership with another architect. By the early 70's the business had grown into one of the larger practices in Dublin and was carrying out major projects throughout Ireland, Africa and the Middle East. In 1985 Val was awarded and made a Fellow of the Royal Institute of the Architects of Ireland (FRIAI). In the late 1980's Val retired from his Architect practice and returned full time to his love of painting. Val Byrne has painted all of his life winning his first major national art competition in Ireland in his teens. Because of his architectural background Val has a particular interest in the urban landscape of Ireland. Most of Byrne's contemporary paintings record Irish scenes of the 20th and 21st Century with an emphasis on harbours and boats and a mixture of domestic and residential buildings. 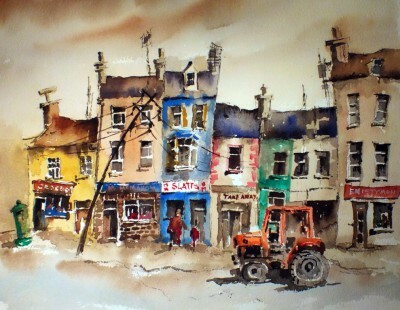 Val Byrne contemporary paintings include the bright colours of the painted buildings which are nowadays very characteristic of the towns, villages and harbours around Ireland. Val has always sought to include in his paintings a degree of quirkyness and the absurd. As he says: "If there is wobbly leaning lamppost with straggling wires in the scene, I leave it in'�, but he also has a developing interest in his first love - Cubism. Today he is probably the only Irish artist working with a Cubist approach to Irish images. Today Val Byrne paintings are held in private and corporate art collections throughout the world including: Mary McAleese, President of Ireland; Mary Robinson, Former President of Ireland and U.N. Commissioner for Human Rights; Jean Kennedy Smith, former U.S. Ambassador to Ireland and several Irish Embassies in Europe, USA, Africa, Asia. In 2004 Val Byrne completed six large paintings for the Irish Ambassador's new residence in Canberra, Australia. Val's paintings have also often featured in publications most notably Forty paintings were commissioned for the book " Bray and North Wicklow" published in 2004 and his paintings of the 75th Anniversary of the Irish Navy are included in " A Maritime history of Cork"
George Callaghan was born in County Antrim, Northern Ireland in 1941. George left school at 15 to work at Nicholson and Bass as an apprentice Commercial Artist. A year later he commenced studying Art at the Belfast College of Art on a Scholarship. After studying at Belfast College of Art George started work in Dublin as a designer. Callaghan then left for London before continuing this career for a number of years working in Australia for a number of leading advertising agencies as an Art Director. At the age of 32 he then moved to the Australian Island State of Tasmania where he lived for many years before moving to France for a number of years. He has now returned to Tasmania but returns regularly to Ireland to sketch and renew friendships. The move to Tasmania prompted a big change in Callaghan's career. He set up a studio which he still maintains today. He also started to make musical instruments becoming an accomplished harp player. He now enjoys the reputation of being Australia's leading Harp maker and a leading exponent of the Celtic Harp. Recordings of his harp music include two compact discs, 'Traditional Airs', and 'Rhyme and Reason' along with several cassettes. However, it is Callaghan's paintings that have created consistent interest over the years. His paintings whether in Acrylic, Oil or Pastel all exude a certain quirkiness and narrative with his native Northern Ireland roots very evident. Although George Callaghan attended Art College, he insists that most of his skills and discipline were learnt from advertising. He believes art cannot be taught because no one knows what art is. All you can teach, George says, is technique - and leave their minds alone. He now paints in the style he developed before he received any fine art training. George Callaghan paintings are in an naive style. His landscapes are without depth or perspective and chimneys are often stylised with puffs of smoke whilst trees appear as little green balls on a stick. Drawing, design and colour are finely developed in George Callaghan's meticulous painting technique. One of the influences on George Callaghan's art works is the surrealist painter, Escher. George has used elements of Escher approach and adapted it to his own purpose. He has a beguiling gift for symmetry and pattern and demonstrates close attention to detail. 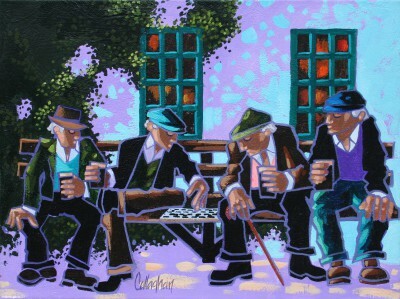 In addition to Red Rag Art Gallery George Callaghan has also exhibited at other leading Art Galleries. Each painting at Red Rag is sourced from the George Callaghan artist studio and like all Red Rag contemporary art it can be shipped worldwide. Fran McCann was born in Belfast in 1945. Fran displayed a remarkable talent for drawing from an early age, but received little art education until he met the renowned artist - John Luke. Luke took Fran under his wing and helped to establish him as an outstanding artist in his own right. Fran McCann contemporary paintings have been influenced by artists such as Salvador Dali, Picasso, Van Gough, Louis le Broche. Other strong influences on McCann have been musicians Van Morrison, Pink Floyd, Bob Marley, Myles Davis, John Coultrane and Phil Linnott. Fran McCann is constantly experimenting. But McCann has established a highly personal and recognisable style. 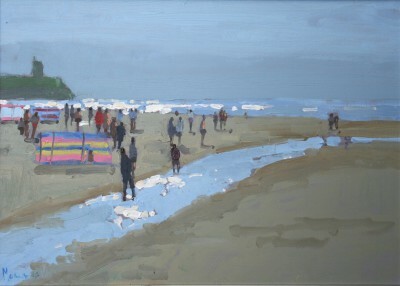 His paintings display energy and passion whether they have been produced in pastels, oils or watercolours. Irish artist John Morris was born in Dublin in 1958. He started painting in 1997. Although primarily a self taught artist John Morris did initially take painting lessons from Irish artists Brian Quinn and Trevor Geoghegan. 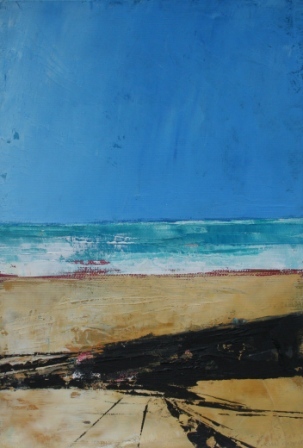 John Morris is an artist with a strong love for the Irish landscape with its constantly changing light and atmosphere. His paintings display vitality and freshness which when coupled with strong and confident brush strokes successfully captures a sense of time and place. Cormac O'Leary was born in Cork city, Ireland in 1969. Having completed his art studies in Co. Sligo, Cormac O'Leary moved to Barcelona, Spain. While there he regularly visited the Picasso Art Museum, the Joan Miro Foundation, The Antoni Tapies Foundation and the famous Gaudi buildings. On returning to Ireland Cormac joined other local artists and set up group art studios. 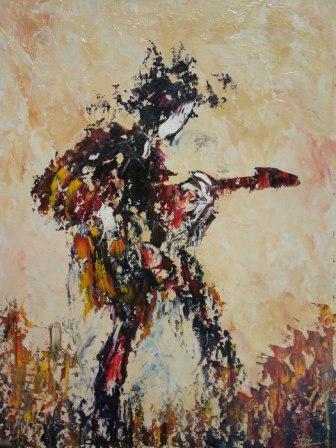 Cormac began to exhibit his paintings locally and nationally, and also published art reviews and illustrations in various outlets, including Arts West magazine, Circa, and the Sculpture Society of Ireland newsletter. 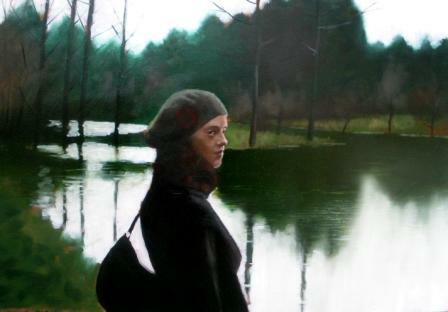 Cormac O'Leary has won several awards for his contemporary paintings and has exhibited regularly in London and America. Today Cormac is represented in many national and international art collections. Brian Smyth was born in 1967. He studied art at the Crawford College of Art and Design in Cork, graduating in 1995 with an honours degree in Art & Design. . Although Brian specialised in painting at college he also studied other various art subjects including multi-media, print, video and photography. Brian Smyth paintings capture the very essence of his subjects. He is equally successful in his treatment of portraits, crowd scenes or cafÃ© society. Smyth is a master in creating a sense of time and place in his paintings and leaves the viewer with an enduring and distant image on which to contemplate. 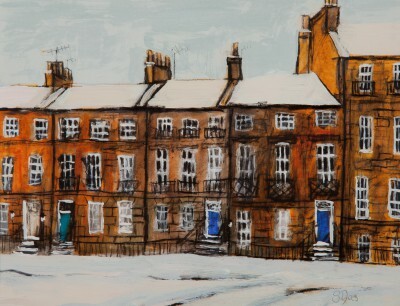 Brian Smyth has won many plaudits for his contemporary paintings and has exhibited regularly in Ireland, England and Scotland. Today Brian's' paintings are featured in many private and public art collections. 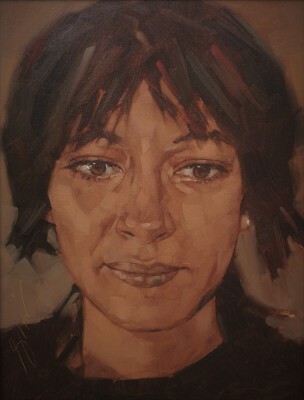 In addition to Red Rag Art Gallery Brian Smyth has exhibited at many leading Irish Art Galleries. Each painting at Red Rag is sourced from the Brian Smyth artist studio and like all Red Rag Modern art and Contemporary art it can be shipped worldwide.